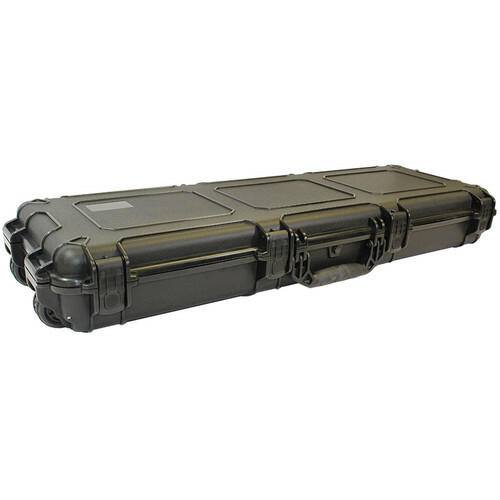 Store, transport, and protect your gear with the waterproof and dustproof black 44" Shotgun and Rifle Carrying Waterproof Gun Case from Condition 1. The ATA/TSA-compliant, made-in-the-USA case features a layered foam interior, automatic pressure release valve, and spring-loaded latches. Carry the case with the comfort molded handle or roll with the built-in wheels. Users will appreciate the O-ring seal, which is watertight to a depth of 3'. For strength and durability the case is constructed from tough lightweight polypropylene copolymer. Box Dimensions (LxWxH) 45.5 x 17.0 x 6.5"